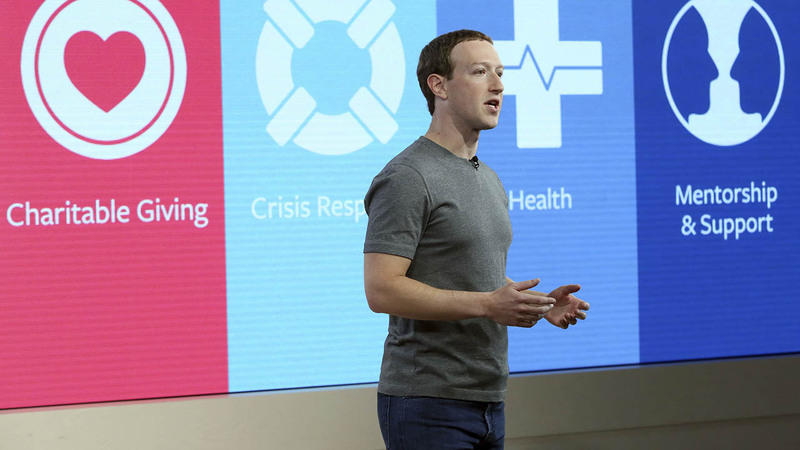 LONDON -- Lawmakers on both sides of the Atlantic criticized Facebook and its chief executive, Mark Zuckerberg, after reports surfaced that another company, Cambridge Analytica, improperly harvested information from 50 million Facebook users. A British lawmaker accused Facebook on Sunday of misleading officials by downplaying the risk of users' data being shared without their consent. Conservative legislator Damian Collins, who heads the British Parliament's media committee, said he would ask Zuckerberg or another Facebook executive to appear before his panel, which is investigating disinformation and "fake news." Collins said Facebook has "consistently understated" the risk of data leaks and gave misleading answers to the committee. "Someone has to take responsibility for this," he said. "It's time for Mark Zuckerberg to stop hiding behind his Facebook page." Collins also accused the head of the U.K.-based data firm Cambridge Analytica, Alexander Nix, of lying. Nix told the committee last month that his firm had not received data from a researcher accused of obtaining millions of Facebook users' personal information. In Washington, Sen. Amy Klobuchar, a Democrat from Minnesota, said on Twitter that Zuckerberg "needs to testify before Senate Judiciary." "This is a major breach that must be investigated," Klobuchar, a member of the Judiciary Committee, said. "It's clear these platforms can't police themselves." Sen. Mark Warner of Virginia, the top Democrat on the Senate Intelligence Committee, echoed Klobuchar's complaint. "This is more evidence that the online political advertising market is essentially the Wild West," he said. "It's clear that, left unregulated, this market will continue to be prone to deception and lacking in transparency." Massachusetts Attorney General Maura Healey said on Twitter that "Massachusetts residents deserve answers" and announced that her office will investigate. The officials reacted to reports in The New York Times and The Guardian of London that Cambridge Analytica, which is best known for working on President Donald Trump's 2016 campaign, had improperly obtained Facebook user data and retained it after claiming it had deleted the information. Former Cambridge Analytica employee Chris Wylie said that the company obtained information from 50 million Facebook users, using it to build psychological profiles so voters could be targeted with ads and stories. Wylie told Britain's Channel 4 news that the company was able to amass a huge database very quickly from an app developed by an academic that vacuumed up data from Facebook users who agreed to fill out a survey, as well as their friends and contacts - a process of which most were unaware. "Imagine I go and ask you: I say, 'Hey, if I give you a dollar, two dollars, could you fill up this survey for me, just do it on this app', and you say, 'Fine,'" he said. "I don't just capture what your responses are, I capture all of the information about you from Facebook. But also this app then crawls through your social network and captures all of that data also." Wylie said that allowed the company to get roughly "50 million plus" Facebook records in several months and he criticized Facebook for facilitating the process. "Why Facebook didn't make more inquiries when they started seeing that, you know, tens of millions of records were being pulled this way, I don't know," he said. Lawmaker Collins said he would summon Nix to reappear before the Parliament committee. "It seems clear that he has deliberately misled the committee and Parliament by giving false statements," Collins said.